Managing Enterprise Server 9 and its integrated 3rd-party applications is done through the Maintenance pages of Enterprise Server. Example: A maintenance page exists for setting up Brands, another for controlling user access, yet another for enabling Server plug-ins, and so on. The pages are grouped in different categories which can be accessed from the menu bar on the left side of the page or from the Home page by clicking 'Maintenance' just above the menu bar. Figure: The Maintenance pages are grouped in different categories. Brands. For creating and managing Brands, including Publication Channels, Issues, Categories, Editions, Workflow Statuses, Authorizations, Routing Rules, and Deadlines. Access Profiles. For creating and managing Access Profiles which control the application features that users have access to. User Groups. For creating and managing user groups, required to grant or deny a user access to the Enterprise system. Users. For creating and managing accounts for users who need access to the Enterprise system. Metadata. For creating and managing metadata properties which can be added to the Enterprise interface of the client applications (InDesign, InCopy, and Content Station). Dialogs Setup. For specifying where and when the metadata properties should be displayed in user interfaces. Named Queries. For creating and managing Named Queries: pre-defined queries that allow users of Content Station and Smart Connection to quickly perform a search in Enterprise in order to locate particular files. User Queries. For sharing custom searches (created by users of Smart Connection or Content Station) with other users or user groups. Export. For exporting PDF files, articles, images, videos, or audio files from Enterprise. Enterprise Server plug-ins. For managing plug-ins that add additional functionality to Enterprise. Output Devices. For defining digital devices (tablets such as the iPad, Android devices, and so on) to output digital publications to. Integrations. For managing integrations of 3rd-party applications. Search Server. For indexing Search Servers such as Solr. DPS Issues. For removing published issues from the Adobe DPS Server and for editing the Free/Paid status and Public/Private status. MadeToPrint. For creating and managing Axaio’s MadeToPrint application for automatically outputting files to print or PDF when a file reaches a particular status. Drupal 7. For The importing Drupal Content Types as Publish Form Templates. OpenCalais. (Since Enterprise 9.1. Only available when the Server plug-in "OpenCalais Suggestion Provider" is enabled.) For configuring the OpenCalais API key, needed for communicating with the OpenCalais service. Twitter. (Since Enterprise 9.1. Only available when the Server plug-in "Twitter Publishing Connector" is installed.) For importing Publish Form templates and for registering an Issue with a Twitter app. Facebook. (Since Enterprise 9.1. Only available when the Server plug-in "Facebook - Publish Forms" is enabled.) For importing Publish Form templates and for registering a Publication Channel with a Facebook app. WordPress. (Since Enterprise 9.2. Only available when the Server plug-in "WordPress Publishing Connector" is enabled.) For importing Publish Form templates, WordPress users, WordPress tags, WordPress categories, and for linking tags to a Suggestion Provider. Enterprise Servers. For managing Enterprise Server instances that need to act as an application server, file transfer server or background processor. Enterprise Server Job Queue. For managing Enterprise Server Jobs that are added to the queue. Enterprise Server Job Configurations. For managing Enterprise Server Jobs. InDesign Severs. For managing InDesign Server instances. InDesign Server Jobs. For managing InDesign Server jobs within Enterprise. Remove by Date. For removing unused articles and/or images that have been added to the database before a specified date. Online Users. 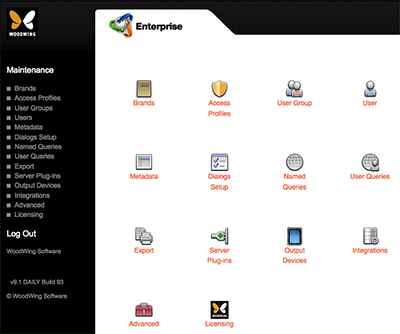 For viewing users that are currently logged in to Enterprise. Service Logs. For viewing logged user actions such as log on, log off, as well as requests made by the client applications (InDesign, InCopy, and Content Station). Health Check. For testing the Enterprise Server installation and configuration. Database Setup. (This page is also known as the dbadmin page.) For installing or upgrading the database for which Enterprise is configured. Web Services SDK. Documentation about the Enterprise Server Web Services SDK. Clear Zend OPcache. (Since Enterprise 9.1) For manually clearing the cache of Zend OPcache. Licensing. For managing Enterprise licenses.